SBI PO Prelims Admit Card 2018: State Bank of India has released the SBI PO Prelims call letter on its official website, sbi.co.in. All the aspirants enrolled for the SBI PO Preliminary Examination can download the Admit card hall ticket from 18th June 2018. while the SBI PO Preliminary examination will be held on 1st, 7th & 8th July, 2018. All the aspirants those who are going to attempt the SBI PO examination can download their admit card as per the schedule. All the hopefuls must download and preserve their hall tickets to show it at the time of verification. Without admit cards candidates will not be allowed to attempt the examination. 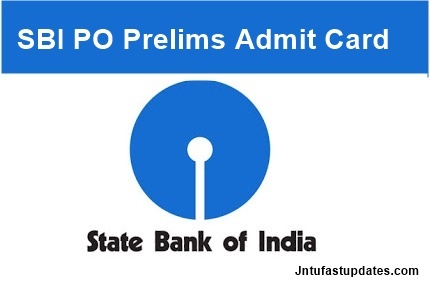 Candidates attempting the SBI PO Examination can check the SBI PO Important dates of preliminary, mains examinations, hall ticket release dates, GD dates and other information from the following article. The State Bank of India has recently issued a notification for Probability Officer (PO) posts. Nearly 15 to 20 lakh candidates have applied for the SBI PO vacancies this year. The State Bank of India selects the suitable candidates by testing their skills through the preliminary, mains examinations and group discussion rounds. Candidates need to qualify in each round to get finally selected for the announced posts of Probability Officer. Candidates those are waiting to download the SBI PO Preliminary call letter 2018 can check the admit card/hall ticket from the SBI Official website, sbi.co.in from 18th June onwards. The SBI PO Preliminary Examination will be conducted on 1st, 7th & 8th July, 2018. By simply entering the details of name, register number, password candidates can download their hall tickets. After downloading the SBI PO Preliminary hall ticket 2018 candidates can check their examination venue, date and time of examination from it. Also the other details such as candidate’s name, date of birth, signature, and scanned photograph etc will appears on the hall ticket. Once candidates can go through the details after downloading the admit cards. The candidates should download their call letter and an “acquaint yourself “booklet by entering their registration number and password/ date of birth from the Bank’s website. NO HARD COPY OF THE CALL LETTER / ACQUAINT YOURSELF BOOKLET WILL BE SENT BY POST.